Heat the butter in a 4-quart saucepan over medium heat. Add the celery and onion and cook until tender, stirring occasionally. Stir in the broth, apple and cranberries. Remove the saucepan from the heat. Add the stuffing and mix lightly. Season to taste. Spoon the stuffing mixture into the baking dish. Bake for 35 minutes or until the stuffing mixture is hot. Time Saving: For easier cleanup, line the baking dish with aluminum foil before spraying with the vegetable cooking spray. 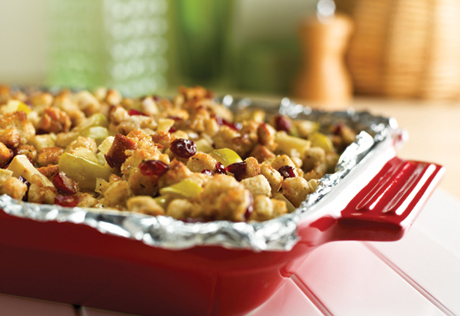 Ingredient Note: For stuffing with a more rustic texture, substitute 6 cups cubed crusty bread (like Italian bread) for the packaged stuffing. Place the cubed bread onto a baking sheet, bake until lightly toasted, then use it as directed in the recipe.